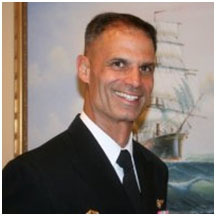 A native of Rochester, New York, Captain Iannone graduated from the University of Rochester and was commissioned an Ensign through the Naval ROTC program in June 1981. He began flight training in September 1981, at NAS Pensacola and was designated a Naval Aviator on 4 November 1982. Upon completion of HH-46 Fleet Replacement Pilot training at HC-3 in San Diego, California, Captain Iannone reported to his first Fleet assignment with HC-16 in Pensacola, Florida. While attached to HC-16, he served as the squadron SAR Officer, H-46 NATOPS Officer, and Pilot Training Officer. In June of 1986, he reported to HT-18 where he served as a Flight Instructor, Legal Officer and Familiarization Stage Standardization Instructor. In February 1989, Captain Iannone was redesignated as an FTS officer and transferred to HSL-74 in South Weymouth, Massachusetts. While attached to HSL-74, he served in succession as the department head of the Training, Operations, Maintenance and Administration departments. In April of 1992, he received a set of follow on orders to HSL-74 as the Squadron’s Officer in Charge. Upon completion of his Officer in Charge tour in June 1993, he was transferred to Commander, Helicopter Wing Reserve where he served as the SH-2G program manager and Wing Safety Officer. In November 1995, he was ordered to the Staff of Commander, Naval Air Reserve Force where he served as the Naval Air Reserve Force’s Program Manager for Helicopters and Training Command programs. In January 1999, Captain Iannone was ordered to HSL-84 in San Diego as the squadron’s Executive Officer and then succeeded to Command of the squadron in April of 2000. Following the disestablishment of HSL-84 in June 2001, he was ordered to Commander, Helicopter Wing Reserve as the Chief Staff Officer where he served until June 2002. From June 2002 until June 2003, Captain Iannone attended the National War College in Washington D.C. Upon graduation in June 2003, he was ordered to the Director Air Warfare Division (N78) staff where he served as the Aviation Training Resources Branch Head (CNO N782B) and as N78’s Reserve Operational Support Officer. In July 2005, Captain Iannone was ordered to San Diego to assume command of Helicopter Wing Reserve. In July of 2006, he assumed the additional responsibilities of Deputy Commander Naval Air Forces Reserve (CNAFR). Following the disestablishment of Helicopter Wing Reserve in May 2007, Captain Iannone reported full-time to the Staff of Commander Naval Air Forces in San Diego, where he served as the Deputy for CNAFR. In June 2008, Captain Iannone assumed command of Navy Region Southwest Reserve Component Command. Upon his change of command in July 2010, he returned to Commander Naval Air Forces Reserve as the Deputy Commander, where he served until his transition to the civilian community in July 2011. In his civilian career he served as a NJROTC instructor at Pacifica and Grossmont high schools.